We're nearly at the end of the international break and back to the proper football. Of course going through all sorts of emotions last night as Robin van Persie was taken off injured at half time didn't help. "He got a knee on his thigh. With a little lucky he can play this weekend again with Arsenal." And we can hopefully breath easily. This picture didn't help my nerves. But I think I'll only really be happy once I've heard Arsene Wenger give him the all clear on Friday. It appears that the rest of our players have come through their games without incident. I can't say I'm impressed with the amount of time our players were used for in meaningless friendlies. I mean, Andrey Arshavin played for 180 minutes against Armenia and Qatar for Russia. Jack Wilshere got off with 150 minutes out of a possible 180. Whilst Samir Nasri played 178 minutes and Tomas Rosicky played 184 minutes. I suppose we just have to be greatful that between now and the end of the season there are no international fixtures to get in our way. We just have to wait for Marouane Chamakh to get back from the Botswana game, which is today. Carlos Vela was the only other Arsenal player on duty when he played for Mexico against Venezuela. He came on as a half time substitute and put in a lively performance. Aside from the international football, there was some positive news on the injury front when Johan Djourou tweeted that he hoped to be back playing for Arsenal against Liverpool on April 17th. If that is in fact the date of his return, he'll have only missed three games (West Brom away, Blackburn home and Blackpool away) which would obviously be excellent news coming into some of our toughest games. Anyway, I don't think we should be counting on him just yet but it's good that he's being so positive about the recovery. As predicted, Jens Lehmann and Jeremie Aliadiere started for the reserves yesterday in their 2-1 defeat against Wigan. By all different accounts it wasn't the best of starts for the German but he did make sure his team mate knew he was there. The game wasn't helped by the sending off of Ignasi Miquel. 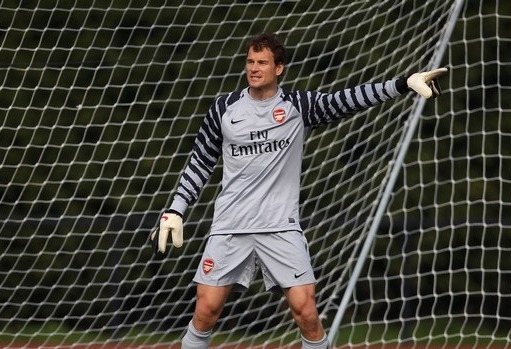 The one positive is that Jens got to spend some time between the posts and will be ready should he be called upon. Finally, the Daily Mirror are linking us with Ajax's defender Jan Vertonghen. It's not the first time we've been Belgian international who played with Thomas Vermaelen when he was at the Dutch club. Manchester United are also said to be scouting the player.